As someone who has been doing her genealogy since the 1980s, I can remember a time before there were many genealogy software options, let alone online databases. In fact, I started my genealogy on forms in a big legal size binder that I would take with me to the library as I scrolled, page by page, through microfilmed census records. Because I started so long ago, most of my research time – when I actually do get a chance to work on my own family – is concentrated on the generations furthest removed in time from the present. Recently a request was made to staff here at NEHGS to “donate” an ancestor for use by junior high students. The request was that the person be searchable in the 1940 census. This got me to thinking that I had never looked up my father in the 1940 census, where he would have been about two years old. As I looked him up on Ancestry.com, I first found his entry in the U.S. Department of Veterans Affairs BIRLS Death File, 1850-2010. I wasn’t surprised to see an entry for him here, as I knew he was in the military in the 1960s – my mother had given me photocopies of pages of his military service, and I was born in Germany because he was stationed there at the time. However, I pulled up the entry all the same and was surprised to discover that he had re-enlisted in 1979, getting out just fourteen days before my 18th birthday. My parents had divorced when I was young, and he elected not to be involved in my life after that, which is why I knew so little of him in my teen and adult life. In addition to finding this, and ultimately locating him in the 1940 census, I noticed that there were twelve family trees at Ancestry that included someone with his name, so I decided to check them out. My reason for viewing the trees was more to see if I could determine who was researching this family than to find new information on his ancestors. I had taken most of his ancestry back at least to the 1600s. However, while I knew the names and places, what was most exciting was the discovery that one of the trees had photos of family I had never seen. The tree and the photos appear to have been posted in 2012. All of which is a not so gentle reminder to me that it’s important to revisit parents and grandparents in the records and the databases, because you never really know what information you may uncover. In the case of my father I not only learned of additional military time, but uncovered a treasure trove of photos of ancestors whom I knew by name and can now know by face. Wonderful reminder and a wonderful post. What a good reminder, Rhonda. Thank you. I hope to have your “luck”. I knew my father all my life, yet never met his immediate family. His photo of his mother is all we have. Unlike you I knew my maternal grandparents quite well and had a lot of information about them. Between oral histories from my grandmother, mother, aunt and cousin plus various records I felt I could assemble there history finally. However, a few months ago I realized that I hadn’t looked at local newspapers for information about them. One of the first articles I found was concerning a lawsuit that my grandmother instigated. She sued my grandfather for non support even though they were living together. The judge found in favor of my grandfather since he had been out of work due to a recent lay-off and had no income to give her. It pays to look at all sources and even for immediate relatives. Nice reminder Rhonda; I’m going back to my work and will do some 1940 research soon ! I do this all the time. My tree is about as large as I’m going to make it and, from time to time, I look for info on more recent generations. I’ve found yearbook pictures for a number of my recent relatives (grandparents, cousins) and hope to find them for my parents too. We haven’t always seen photos of some of our relatives at that age. And I search newspapers – probably weekly. More newspapers are being digitized every day and the possibility for more discovery improves. I found a newspaper item that a servant in the household of my great-grandparents as a teen ultimately got married at their home and my grandmother was one of her bridesmaids! (I found this when I was looking for stories on my grandmother.) The wedding was described in some detail. And then I realized that I have a picture of the bride in later life. The more you dig, the more you find. 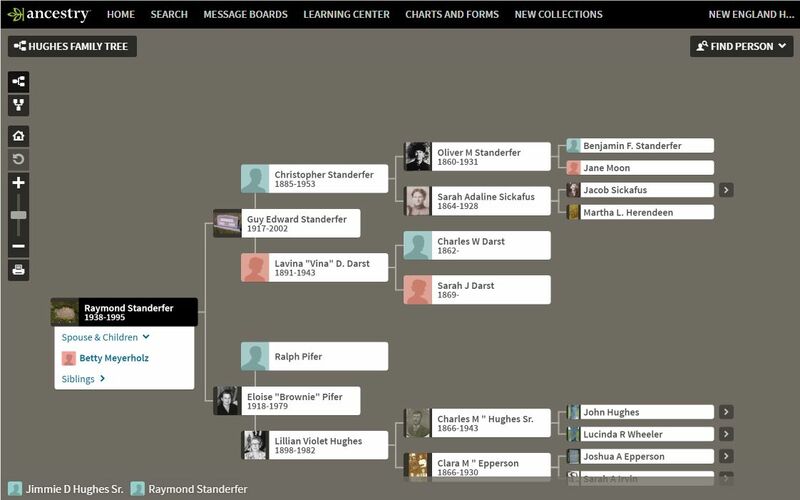 Thanks for the reminder to keep up the search for near ancestors. I’ve done a little of this, and found, among other things, my father’s divorce record from his first marriage, from a newspaper. We had a rough date, but not even my half-sister, the child of that marriage, had known for sure. The 1940 census also told us exactly where our father, his first wife, and their child were living. Again, we knew what city, but this pinned it down. I’ve never thought to look at family trees to see what they say about my parents or grandparents. I only knew one set, as the other died before my birth. I knew sisters of that grandmother, but almost no relatives of my grandfather. It might be especially interesting to research him. Both my maternal and paternal grandparents were a part of my life while I was growing up. I practically lived with my paternal grandparents as their home was nearby and I met many people. But it was only when I began to expand my family tree beyond those whom I knew to be related, that I came to realize how many of those acquaintances were actually distant relatives. Like many of you, I needed to be reminded to go back and thoroughly examine the work I had done, the census records, family photos and any other material I could find. Thanks to Rhonda for a great article! It also shows the importance of being in touch with your second and third cousins that are still alive. I have gotten tons of information, including pictures of my own direct ancestors, because of my friendships with my second and third cousins. That is why when I do my family tree, I tried to do all the descendants of certain family groups. It is the only way to determine who might still have information that they can share with me. Thank you. I have been looking at Horace Greeley’s family as he was a friend of my ancestor, also a newspaperman. In the process of looking at his jobs (one in my hometown) I found a reference that my ancestor had worked there too. Unexpected. They both had only spent months there, but essential collateral proof in a complicated split family history. Sometimes it is the small things that lead to big discoveries. I recently started to research these closer ancestors as if they were unknown to me. I didn’t actually have documentation for my parents and grandparents because I knew them. I knew birth, marriage and death facts. Now I’ve collected solid sources for birth, marriage, divorce, death, land, probate, etc. I’ve learned so much more about their lives and have a better timeline of their life experiences. I know now that my grandparents went into business with grandma’s brother. The story comes out because the brother died and they are included in his probate. All the shared assets are spelled out. This fleshes out some of the stories my grandmother told about life on the wheat ranch. I understand them much better for doing this research. My father and his family were never a part of my life, although I knew my father. At age 70, through DNA, I found a 1C1x removed and he had a treasure trove of pictures of my paternal grandparents. I never looked like anyone I knew until I discovered my paternal grandmother. I look exactly like her, and I am even very short like she was. It is a comfort to know I look like a relative. Thank you, Rhonda. I just went looking for a college paper I wrote after interviewing my maternal grandmother about physical traits of people she knew. None of this is in my charts. The original is now safely away and I can scan this copy. My paternal grandmother was born on Halloween. Now, I knew her vitals, but all I knew about her parents and grandparents were their names ,a few dates, and that they were born in Bavaria. On Halloween a few years ago, I realized that it had been a very long time since I’d looked for new info. So I did a Search and found out on a distant cousin’s site remarkably complete data on SEVEN further generations! So, don’t give up on near ancestors, no matter how stubborn your dead-end may has been!